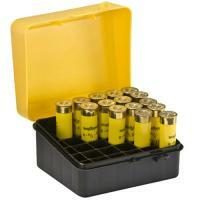 Ammunition boxes are a convenient way to store shells at home or for transporting them to the range. The 20-Gauge Shot Shell Box by Plano will hold all your ammo securely in one place, while keeping them from spilling all over range bags during transit. The case is designed to hold up to 25 rounds of 20-gauge shells. The flip-top design offers convenient access to spare ammo, while lockable tabs keep unauthorized hands out of the box. Save time at the range by filling up Plano's box at home.